Step into the library of the future, where waiting for what seems like ages while a librarian with a trolley fills requests has been replaced by robots that find, deliver and return books on demand, and within minutes. There’s a technological change happening in libraries that is transforming the way those sources of information are being used. No longer are libraries only book repositories, filled with stacks floor to ceiling and shelves that shroud most of the library floor. As part of a $1 billion upgrade of its city campus, the University of Technology, Sydney (UTS) is installing an underground automated storage and retrieval system (ASRS) for its library collection. The ASRS is in response to the need to house a growing collection and free up physical space for the new ‘library of the future’, which is to open in 2015 to 2016, so that people can be at the centre of the library rather than the books. Having the extra space will allow for more interactive learning environments where students can work more collaboratively in the library – for example, mixed media spaces for video editing and production. 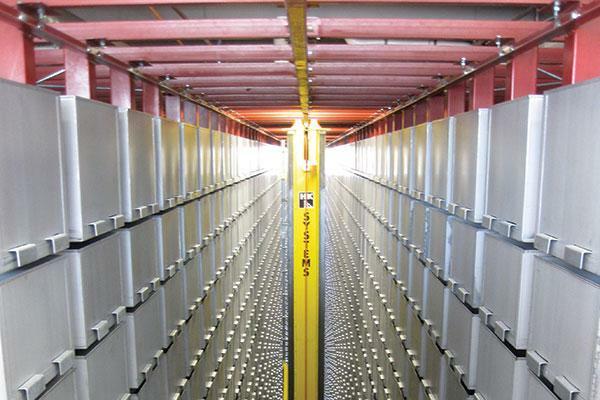 The ASRS, which will connect to the new library, consists of six 15-metre high robotic cranes that operate bins filled with books. When an item is being stored or retrieved, the bins will move up and down aisles as well as to and from the library. Items will be stored in bins based on their spine heights. About 900,000 items will be stored underground, starting with 60 per cent of the library’s collection and rising to 80 per cent. About 250,000 items purchased from the last 10 years will be on open shelves in the library. As items age, they will be relegated to the underground storage facility. The ASRS integrates radio frequency identification technology where each item is tagged with a unique identifier so that they can be tracked for retrieval. RFID acts as a link between the warehouse management system for the ASRS and the library catalogue. Students will be able to request an item in the underground storage facility via the library catalogue and have it delivered to a library service desk within 15 minutes. UTS university librarian, Mal Booth, who is working closely on the project with the university’s CIO, Christine Burns, says the library retrieval system is the first in the world to integrate RFID technology, making it slightly different to Macquarie University’s ASRS that uses barcodes. He says it can “store up to seven times the amount of books in a given normal library space” and can store items efficiently; many items can be scanned at a time using RFID, whereas barcodes only allow items to be scanned one at a time. Besides using RFID for tracking and retrieving items, the university also plans to use it to collect and analyse data to help design its new library. By tracking the location of items, Booth says it will help determine how students make use of the library’s collection and where they are most likely to browse books. “In the second phase of RFID we want to be able to be a bit cleverer in tracking where books have been used, how they move around campus,” Booth says. “Previously, we didn’t have the capacity to collect data on how those books were being used. With RFID, we can more easily collect data by quickly scanning a run of books that have been retrieved on a trolley, or by having a smart shelf on the trolley.